Attorney Julia M. Brown, J.D. 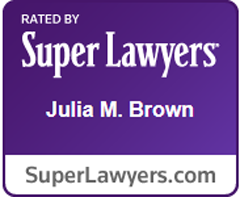 is the founding principal of the Law Office of Julia M. Brown, LLC located in Waterbury, Connecticut. For the past 24 years Attorney Brown’s practice has focused exclusively on providing “critical legal care and supportive services” to elders, the disabled elders and their families. Her staff consists of professionals in the legal, accounting, social worker and nursing fields committed to advocating and providing “holistic” service to clients and their families who are in crisis as well as planning in advance of crisis. Services are provided to clients at home, in the hospital, in assisted living facilities and in nursing facilities. Attorney Brown is admitted to practice law in Connecticut and New York in both state and federal courts and has authored numerous articles; she consults and lectures on estate planning for those in crisis, medical decision making and end of life issues; assisting and advocating for elders and their families transitioning through health care and long term care systems; obtaining eligibility and access to health and long term care entitlements and insurance coverage; and related elder and estate tax issues. Attorney Brown is a founding member of the Connecticut Chapter of the National Academy of Elder Law Attorneys (NAELA), a past Director for the Alzheimer’s Association South Central Chapter; a founder and current Co-Chair of the Central Naugatuck Valley Senior Services network, a member of the National Association of Social Workers and the Legislative Chair for several elder organizations. She is an Executive Member of the Connecticut Bar Association Elder Law Section and past Chair of their Medicaid and Continuing Legal Studies Committee’s.